Here we are! Being silly and having fun as a family. Sometimes you just gotta get out of the house. We’re at Apple Annies in Willcox Arizona. They have the most amazing corn maze going on right now. The thing is huge!! You could get lost in there. Every year they plant a different one and this one is all about space. Check out their website and go look at the picture. It’s too cool. If you live around here they will be open until the end of this month. Get thyself down there! We picked pumpkins for both pies and jack’s. My talented sons, Eric, Scott and Lee (my son-in-law). This will be my first attempt at making my own pumpkin filling. I’ll let ya know how it turns out. Two buckets of tomatoes, 1 bucket of poblano and green peppers and 5 butternfut squash. I’m going to try to make butternut ravioli with a pasta recipe from Mary Capone. We’ll see! 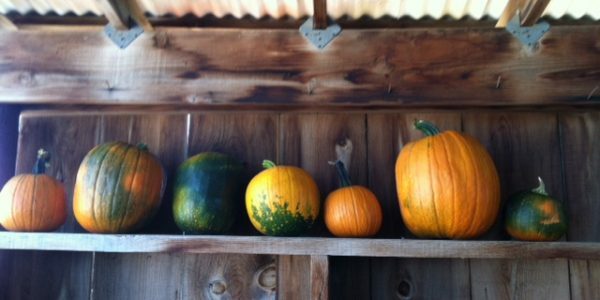 Here’s all our pumpkins lined up in a row. My artistic girls had them pose for the picture. At least they cooperated. Me and my pumpkin at the farm stand. Walking through the fields, it smells warm and earthy. They had a late frost here and lost a large portion of their apple crop. Not easy being a farmer even here where the temps are fairly mild. Earlier this year they had a another frost and lost about 75% of their peach crop. Tough year for fruit. It really is a small world. We ran into four families that we know from church. You drive 1 1/2 hours away to see people you haven’t seen all week. Crazy! Thanks Apple Annies for providing my family with a great place to just chill and have a fun day in the country. PS.. Take your family on a trip to a U-Pick farm near you. Take lot’s of pictures and send me some! I’ll be waiting for my apple pie.